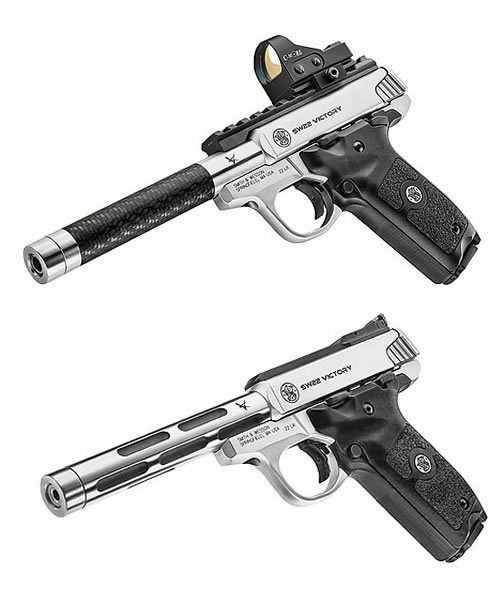 Shooting Review: The SW22 Victory Pistol | Eagle Gun Range Inc. I typically review personal-defense weapons so it was an interesting change of pace to spend time with a fun, target pistol for a while. I’m not a true precision-shooting hobbyist so at first I didn’t know what to make of the SW22 Victory pistol. It didn’t take me long to become a fan. I had a blast shooting it and expect I’ll be purchasing one soon. Here are my impressions after putting a few hundred rounds through this interesting and option-rich pistol. Why Consider the 22 Victory? The SW22 Victory is purpose built for target shooting and comes in three stock configurations (more below), each with hi-vis fiber optic 3-dot sights, yet at just a hair over $400 it is relatively inexpensive. It is heavier than most pistols, owing to the precision-shooting nature of the model. The heavier frame and match-quality bull barrel add stabilizing heft that allow for steadier sighting. 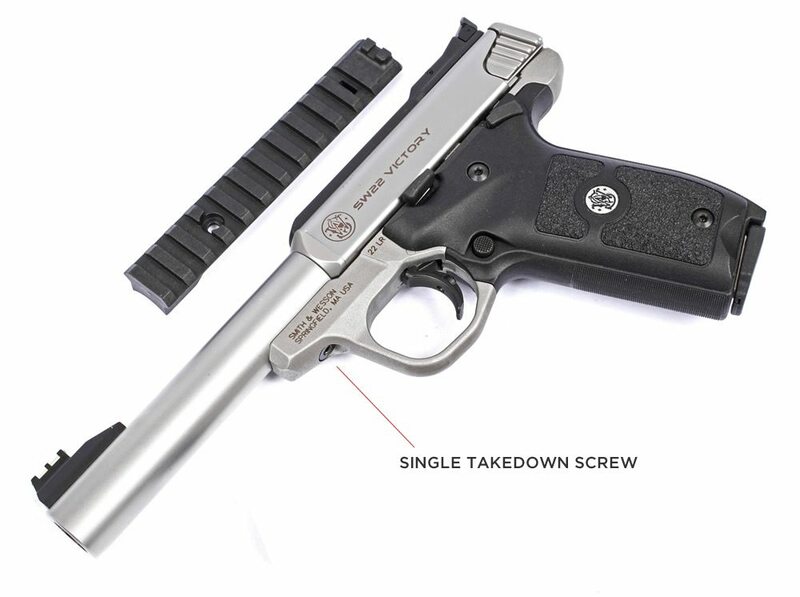 Unlike some other .22 pistols, takedown and disassembly of the Victory is very easy; just use the included hex key to remove one screw and you’re done! Want to swap out the rear sight for the included picatinny rail? Just remove one screw. Want to replace the barrel with high-quality, aftermarket, competition option? Just remove one screw! The SW22 Victory comes in three stock configurations. The basic configuration features the heavy, match barrel and has an MSRP of $409. The second configuration is with a threaded match barrel, with an MSRP of $429. Then there is the Kryptek® Highlander™ finish on the steel components, with an MSRP of $459. If you prefer an optic to the 3-dot sights, simply remove one screw and swap out the rear sight assembly for the picatinny rail that comes with the pistol. 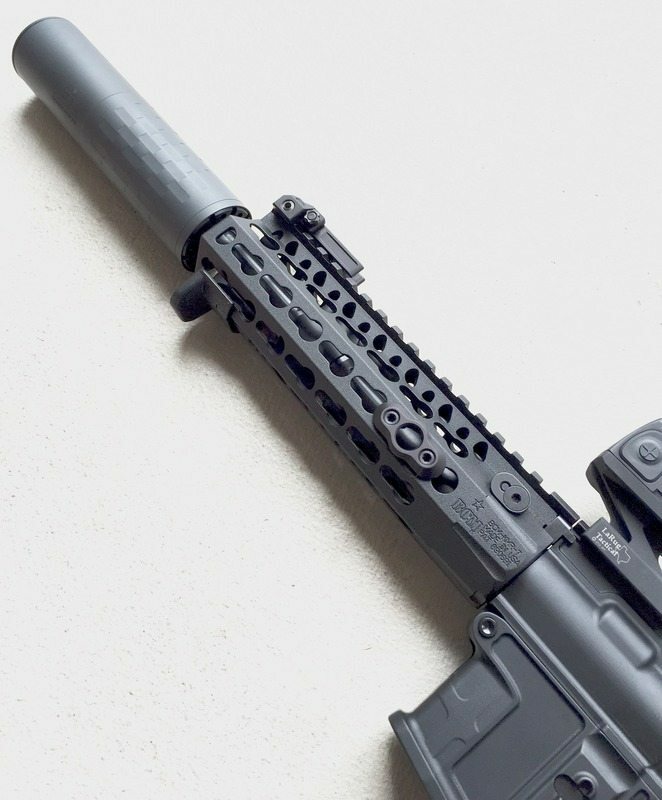 The rail even sports a back-up sight on the rear in case your optic fails. Fun! Shooting the 22 Victory is fun, and accuracy is easy (and did I mention it was fun to shoot!) I was making -1” groups of ten rounds at 7 yards and 2” groups of ten rounds at 15 yards, all without a bench rest. Though I was not allowed to leave the 25-yard range with it, I believe I could have hit soda cans at 100 yards with this pistol without breaking a sweat. The trigger is fantastic. Trigger break is reportedly at around 3.5 pounds, but I got the impression that it was perhaps a bit lighter than that. I didn’t try it, but the trigger has an adjustable stop so that you can tune it to fit your preference. The trigger has a flat, ribbed face and I found the takeup, break, and reset to be as close to perfect as I’ve felt on any gun. What a joy to shoot! I shot 50 rounds of Aguilar .22 Interceptor, rated at 1470fps, and 400 rounds of CCI Mini-Mag 22LR, rated at 1235fps, through the Victory with no hiccups or failures. Both of these rounds are a bit hotter than what you’d use for true precision shooting. Even so, there were no recoil issues and I was able to keep my sights on target with almost no effort. When cycling, only the bolt assembly reciprocates inside of the upper frame rather than the whole slide moving. This along with the hefty frame helps to mitigate movement while firing. 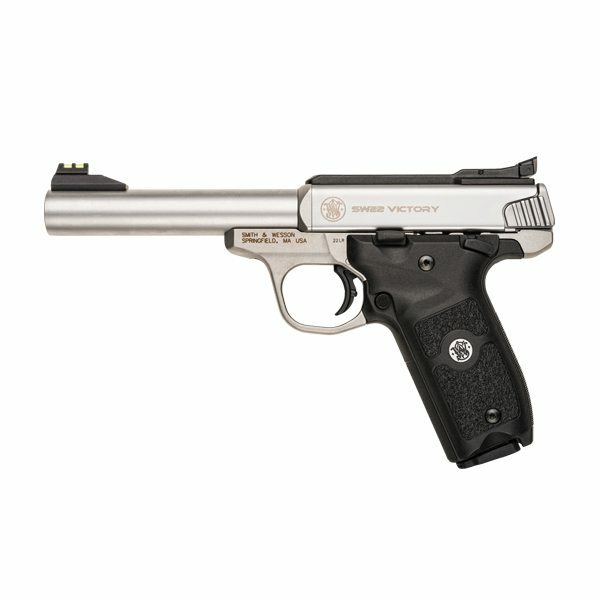 The SW22 Victory is high-quality, accurate target pistol right out of the box. The quick and easy takedown and component replacement are a big plus and something not found in other similar .22 pistols. Desirable upgrade components are available and not extravagantly priced. The sights are excellent and the trigger is flat out fantastic. And for all of this, the price is far lower than one might expect. While one could argue that the absence of any real recoil mitigates this issue, the grip is not of the most ergo or form-fitting design. It’s a fantastic shooter. The hi-vis sights and heavy barrel make sighting and maintaining sight picture quite easy. The 22 Victory is a target pistol and I found the accuracy to be superb. The pistol comes with a picatinny rail and there are superior aftermarket barrels available. It even has an adjustable trigger stop. The SW22 Victory is a heckuva pistol. I tend to take a strictly practical approach regarding which firearms I choose to get, but this one really tickles my fancy. The features, the price, and the fun make it hard to put down and I have to say I’m fairly certain I’ll be getting one for myself. With the superb out-of-the-box components and accuracy, I’d expect such a powerful and adaptable package to cost quite a bit more than $410-$430. At that price, even if you’re not into precision shooting the 22 Victory makes for a very nice plinking gun. If you are into precision shooting or thinking of starting, the SW22 Victory seems like the perfect place to start. This review was obviously written before the take-down screw fiasco was discovered and the subsequent complaints and recommended fixes for the problem burning up the gun blogs. Initially, the screw was found to loosen during firing, so shooters of the Victory should check the tightness of that screw every 50-100 rounds. While avoiding blue Lock-Tite, it appears prudent to place a #61 O-ring on the screw and apply a drop of Vibra-Tite VC-3 (does not permanently lock the screw in place) to the threads every 5th disassembly of the pistol. Then, later-built pistols were discovered to have the take-down screws over-tightened to the frame, and owners were destroying the manufacturer-supplied hex-head wrenchs attempting to remove the take-down screw (inferior quality?). Applying aerosolized ‘air’ to the screw (to freeze and slightly-shrink its diameter) and then attempting to remove the screw with a longer, quality hex wrench of the correct size, or using a T-handle hex wrench, but NOT a ball-head hex wrench (they break without undue strain). It may require the assistance of a competent gun smith to remove the screw; Smith & Wesson customer service has been +/- on doing the screw removal. 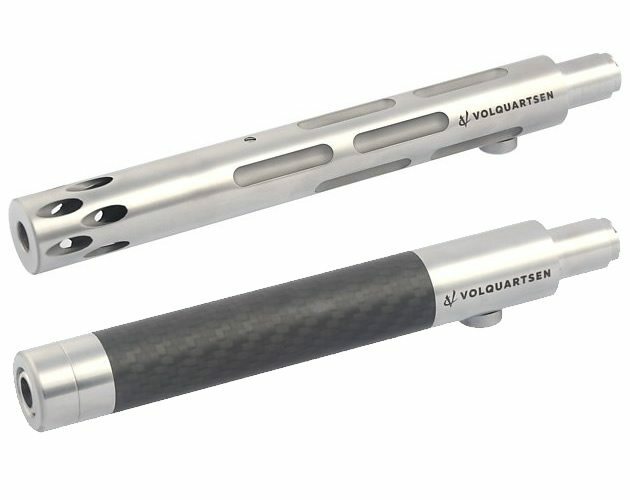 As Volquartsen has entered the ring with longer replacement barrels for the SW-22 (Victory) in a lightweight carbon fiber configuration as well as an I-fluted stainless barrel design, I would be curious to see which of the two is the more accurate, compared to the 5.5 inch match-grade barrel supplied by S&W with the pistol. S&W has a new take down screw that seems to have fixed the loose screw problem. My Victory came with the new screw and I haven’t had the screw come loose after prolong shooting. If you contact S&W’s customer service I have heard that they will send you a couple of the screws free of charge. Up front, I’ve never even held or shot a Victory. But I’ve owned and of course shot many .22 semi auto’s. Several Ruger Mark series, Brownings and my go to now is a S&W 22A. What caught my eye with this pistol is the easy breakdown. I teach novice shooters, including many women. For people who aren’t mechanically experienced and not blessed with good hand strength, this pistol looks like a winner when it comes to cleaning. I’m mentoring a woman now who wants to buy a .22 semi. She loves to shoot my S&W 22A but finds the takedown and reassembly beyond frustrating even with YOUTUBE videos, my guidance and practice. After serious research, I recommended she buy the Victory. Without ever having held or fired one. That’s a first for me. Her being able to clean her pistol without dreading the takedown and reassembly is off the charts important.